Emily Marschwic, a well-born young lady in a country at war. It starts out with a regency-novel type of setting, it's a secondary world but with limited fantasy elements. Things are difficult due to the war stripping men , boys and resources from the country, but Emily understands her life and her world. Emily is neither a wife and mother like her older sister, nor easily distracted by ladylike concerns like her younger sister. She has a keen sense of justice and when she's affronted by the way local affairs are handled she harangues the local mayor-governor, an odious, conniving man who pushed her father out of his position and into despair. The war is going well they say, but yet it needs more and more until the army starts drafting women. Emily is sent to training with other women, but she's the only upper class woman among them, and then she goes to the front. 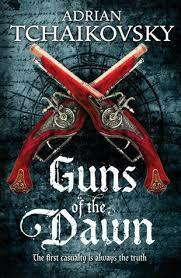 The bulk of the book is set in swamps that have become battlefields, where the commander doesn't understand non-conventional warfare and the terrain is a challenge for all but the most skilled of scouts. Emily encounters the enemy and learns some of their character, but never wavers from her role as a loyal soldier. This novel is about the horrors of war, in so many ways. The actual physical danger is clear, but the psychological affects of it are fully explored. The way different people react to personal danger and duty, the way some rise to the challenge, while some don't and many never get the chance. The burdens of command and the importance of friendship are strong themes. There's so much in there, so much is addressed but all through the viewpoint of a determined and loyal woman who becomes an effective but weary soldier. 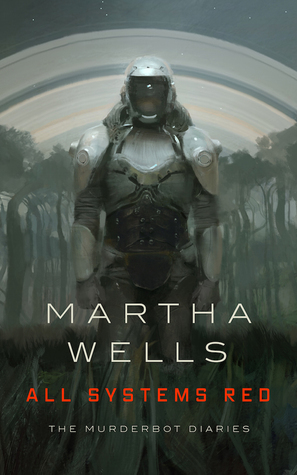 The story is told from the point of view of a cyborg who is deployed to do security for a small team of humans doing a survey on a planet. Neither the human science team nor the Company who owns it knows that the self-styled Murderbot has hacked the software that should control it. Mostly Murderbot is bored and wants to do half-assed job keeping the humans safe and be left alone to watch entertainment feeds. Then things start going wrong, and another survey team on the planet disappear. The sullen, anti-social Murderbot has to suffer through close, awkward interactions with humans in order to save everyone. This story is simple but lots of fun. Although there's danger and bad things in the main plot and in the background/backstory it feels like fairly optimistic SF. This is probably because the human characters seem to really care for each other, and although they aren't very well described (Murderbot isn't interested in humans as people, just clients) we see enough of the team to get a sense of the friendship there. This is all filtered through the very anti-social viewpoint of Murderbot, who likes to pretend to be as robotic as possible and does not enjoy things like conversation and eye contact. I'm pleased to hear that there are more stories in this series. This is a novella, rather than a novel, which means it's a fairly slim book, with a few chapters. It's a nice format for me at the moment because I can finish something fairly quickly, even around work and childcare. Also it was good to read something short after a large novel. Speaking of robots that enjoy entertainment media, this is a delightful story about a sentient robot in a museum who discovers an anime, and then discovers fandom. Computron doesn't have emotions, and so it can't actually enjoy Hyperdimension Warp Record, nor can it feel frustrated by how long it takes for the next episode to drop. It discovers online discussions, and quizzes, and fics, and fan art. Soon it's writing its own fics, collaborating with other fans. The story shows how an online community helps am isolated robot with a lot of time on it's hands, I mean claws, to discover creativity and friendship. Though Computron insists it doesn't have emotions I think it doth protest too much. I'm not involved in specific fandoms myself, but I know people who love them and understand the value they have. The way this story portrays the fandom is very fun and inventive, and though it's depicting mostly text-based communication it works really well in audio as the narrator skillfully gives life to various online personas. This is an exciting and meaningful story set in a city where the glamorous art of dueling is defined by a strict set of rules and used not just as entertainment but as a way of balancing to major faction in the city. Told from the viewpoint of an enthusiastic apprentice, who describes the skill of her esteemed mistress, and her mistress's opponent. The story establishes the system, shows how things should work, how they do work and then how they go wrong. The wealthier faction sets out to destroy the other, and instead of relying on the skill of their swordswomen, they resort to underhand measures. Similarly the officials of the poorer faction try to keep their champion from her duels to avoid further losses. The traditional ways are ignored in favour of a kind of progress, but the women of the old system have more common with each other than devious, politically-minded men. The narration is good, really capturing the youthful apprentice as she expresses admiration, embarrassment, and despair. I can't find my ipod charger at the moment, which is making it hard for me to listen to more podcasts. It must be around somewhere, but it's so small and I'm having to move things around quite a lot at the moment. It's irritating, but I'm sure I'll sort it out soon.